I have this recipe thanks to a really sweet girl and a lovely new friend - Anne from Anne's Kitchen. Anne made this fudgey chocolate cake back in December, but I only discovered it after spending a happy couple of hours browsing through Anne's archives. As soon as I saw it I knew I had to make it and it certainly didn't disappoint. I met Anne over at The UK Food Bloggers Association. The UK Food Bloggers Association (UKFBA) was founded in 2007 by Julia Parsons, a British Food Blogger who writes the blog 'A Slice of Cherry Pie'. Julia set up the association to create a community for the growing number of food bloggers in the UK to network with, get to know, and help and support each other. The association also enables food bloggers from around the world and people from outside of the food blogging world to connect with the British food bloggers. It's the first point of call to find out what's hot and happening from the people with their fingers on the pulse of the British food scene. To begin with Julia set up a blog, where British bloggers could post and chat. She also set up a foodie forum, but the latest edition to the UKFBA is a social networking site that is a bit like a facebook for food bloggers. There was, at my last count 253 members and it has attracted support from UKTV Food, Mat Follas, the 2009 winner of Masterchef, food presenter Lotte Duncan, the New Covent Garden Food Company and my favourite vegetarian cook & food writer Celia Brooks Brown. It really is well worth a visit and I hope some of you will join up. But enough of the preamble and on with the recipe. Place the butter, both sugars, chocolate and golden syrup in the pan and melt gently on a low heat until it is smooth and lump-free. Remove the pan from the heat, break the eggs into the bowl and whisk with the fork until light and frothy. Add the eggs, vanilla extract or essence, flour, baking powder and cocoa powder to the chocolate mixture and mix thoroughly. Put the mixture into the greased and lined cake tin and place on the middle shelf of the oven. Bake for 25 minutes. 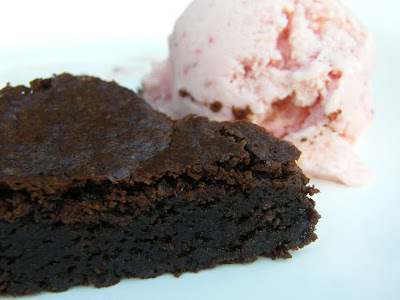 I served my chocolate cake warm with homemade strawberry ice cream. It was divine! Although it is also good to bite into cold with no frills. This recipe is definitely a keeper! Holler, can u send this over.. after lunch an hour back i was telling my hubby that i need something real chocolaty now.. & was contemplating making a choco. tart sometimes soon!! I come here to drool & want this soo bad. Would if I could Soma, I am craving this too, but it is finished unfortunately! Hey Anne, and thank you for the recipe :) Toasted hazelnuts, that sounds like a great addition. That cake has a very fetching appearance. It makes my teeth tingle just to look at it! Dear Holler. Oh my, that looks so evil and yet delicious. I have been going through this crazy chocolate craving phase since having a baby (thought the cravings were supposed to kick in BEFORE the baby came). I might have to give this one a go! Hi Andrea, I don't know if that is a good thing! Hope you try it Little Miss Moi. I say go with the chocolate craving, always! Hey, I had a question. Do you mix it using an electric beater or a whisk while adding the eggs? That cake looks sooooooo yummy! Too much too early in the morning!!! Hi Delhibelle, it was lovely and fudgey. Eating it would make you even happier! Hi Johanna, the ice cream was actually quite a quick recipe, I used ready made custard instead of making my own. I will post it another day. Hi A & N, I just whisked the eggs with a fork, but you could use a hand whisk, there is no need to get out your electric whisk for this part of the job. Wait until tonight and look at it again Celia, hehe! Holy yum! That looks like a decadent brownie in fancy cake form. Perfect! Oh my Holler. So moist and dark. I just love this. I am making brownies and they are in the oven as I type this. I hope they work out as well as this cake! Just the type of chocolate cake I love. . .dense and fudgey! Looks divine. Make another one of those sinful creations and UPS RED it overnight to me!!! I will keep that in mind Staci, although I don't think the ice cream would travel well! Oh, that cake looks wonderful. And, i've been partial to a bit of recipe stealing from Anne. She makes such yummy foods! Oh, Holler, this cake looks fantastic. I'm so glad that I'm finally getting back to blogging. Man oh man, I've been missing out on treats like this!! Looks great. 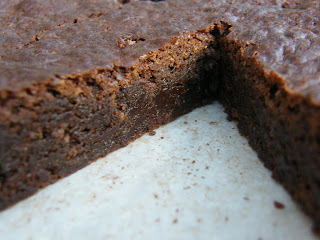 Love fudgy cakes and this one looks perfect - yum! WOW, this fudge cake looks almost insane...wish could have a bite of it...Looks really yummie. Nice pictures. Oh yum yum yum! Fudgey, chocolatey, dense - sounds like heaven :) Time to fabricate an excuse to bake it right away! What a gorgeous hunk of chocolate! Any cake that has "fudgy" i the title works for me. That looks delicious! I'm not the first to say it... and I won't be the last... but you did have me at "fudgey"! Chocolate is great. But fudgey is ALWAYS better. You've done it again, my dear. And it looks delish. Oh my, that looks bloody fantastic! Thanks so much for the shout-out about the UKFBA - hope we get lots of new members to chat to! I am with you Katie, Anne has a lovely blog! I am glad you are back and now have a break from all that hard work Elyse, I look forward to catching up with you soon! Hi Diann, indeed! Anne came up with a corker with this cake. That cake looks wonderful, I would kill for a slice right now, lol! And Anne is lovely, I met her at the GFS last November. Hmm how did I miss this post?? That cake looks so good.